Behold! 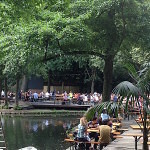 Top 5 Biergärten – Berlin best beer garden guide is out! We know…we know…there are a thousand “BIERGARTEN GUIDES” around. It does seem fitting, though, that we let you know what are our shortlist of favourite ones. We always keep our lists short. Not because there aren’t a million options (there are!) but because we feel it is our goal to help you experience the places we feel have something special about them. It is, however, no easy task. “Biergärten” (plural) are all over town. And we must admit, there are hundreds of decent ones. If you happen to walk by one that you feel have a nice vibe, by all means, try it. You are bound to have a truly local and amazingly relaxed experience. That said, ff you are looking for the essential and most interesting ones, follow the list below. Whether you try one of them or a few, you are guaranteed an unforgettable experience. – Most Beer Gardens open from late April to late September. The warmer the day, the more lively and animated these places are. 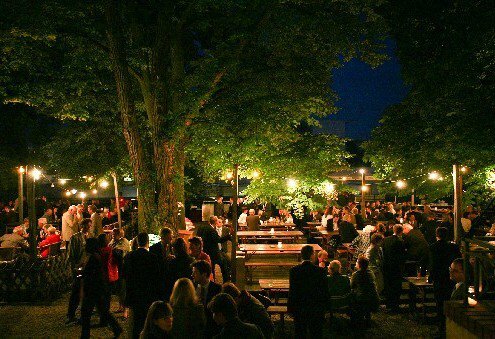 The best time to visit them is from 5-10PM, if you are looking to capture the true vibe of a German Biergarten! – Get in, grab a spot, sit down. Send someone to get the grub and the beer. – Enjoy the communal atmosphere and share your table. It can be a social experience if you like, but no one will bother you if you are not into chit chat. – Most of the places below also have restaurants, however, we recommend an outdoors, chill experience in communal tables and below Chestnut trees! 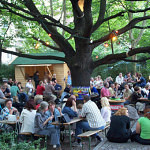 Prater is considered the oldest active biergarten in Berlin. And somehow it manages to stay current, fun, upbeat. As the sun sets and the lights twinkle below the Chestnut trees, the most magical atmosphere takes over this place. Come here during the day and you will miss on a fantastic spectacle. Stay until later and you will be rewarded. 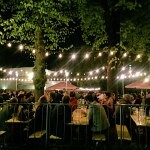 This is our “go to” biergarten. 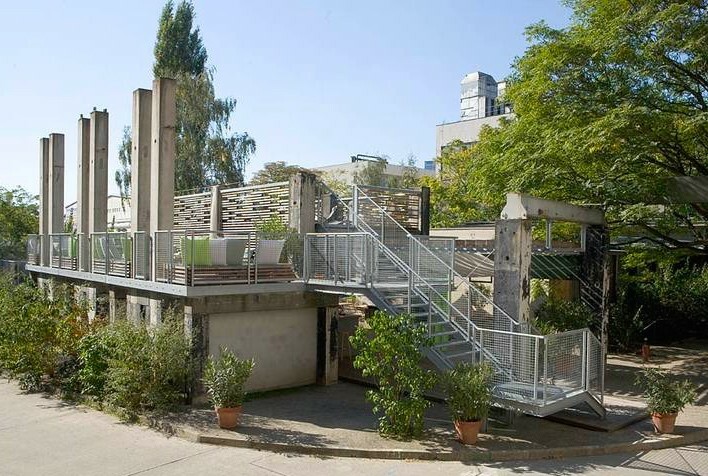 It is located in the heart of Prenzlauer Berg, one of the coolest neighbourhoods in Berlin. We love taking our dog here. 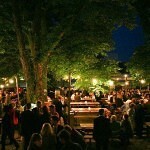 This biergarten has a privileged location by the river and near the Parliament and Chancellery. Cozy and atmospheric contrast to the modern architecture. The beer is top notch. Make sure you sit down below the Chestnut trees. Get your beer and watch the boats go by. It’s magical. Take a walk along the river banks towards Bellevue Palace afterwards (or beforehand). This slice of paradise is located around Tiergarten Park, right by the Spanish embassy. There’s a very atmospheric restaurant here (which is also worth a visit). 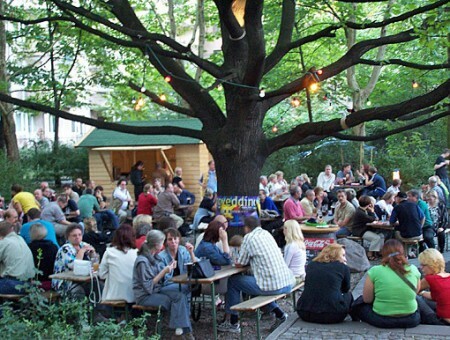 But let’s focus on the biergarten. It is surrounded by woods and a lake. Unlike some beer gardens, this one can also get quite busy during weekends (when the weather is nice), so it may require some planning. Make sure to try their pizza (not typical) with the beer. 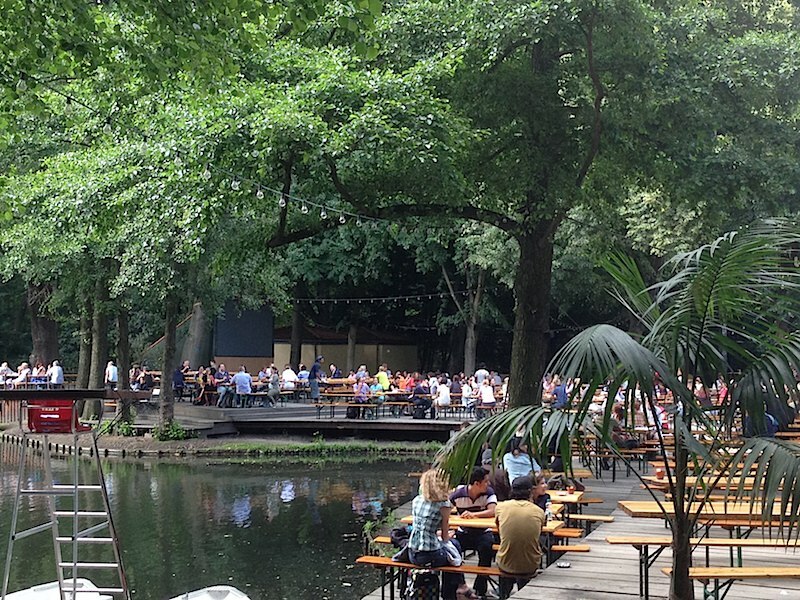 This place is also very close to the back of the Berlin Zoo, so why not combine a trip to the Zoo with a satisfying Biergarten experience? Eschenbräu has possibly one of the funkiest locations of this list. 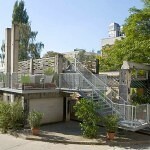 It is located in a cellar of an apartment building complex in Berlin Wedding. It’s a mix of brewery and biergarten. The cellar spills out into a fun courtyard. Here you can get either one of the three traditional brews (pilsner, dunkel or hefeweizen) or one of the nine seasonal brews. It’s really a beer lover biergarten. And totally worth a visit. You may also refer to the ones below. They are also amazing biergärten! Check them out if you find yourself near them. 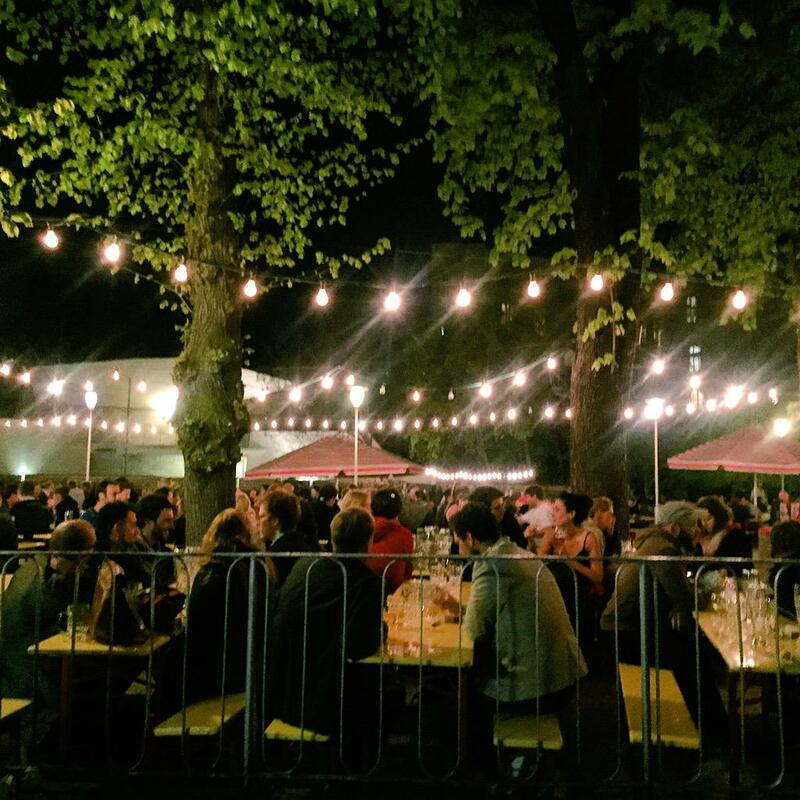 We will review this list frequently so you are assured we are giving you our best appraisal of Beer gardens not to be missed while in Berlin.